It all started in 2012 when I tried paracanoeing for the very first time and was spotted by the coaches at a talent identification day. Fast forward 4 years to September 2016 and I was on my way to Rio for the Paralympics to represent the UK in the K1 200m paracanoe race. On the day of the first race I was in Heat 1 and up against the current World Champion from China. The conditions were good for me with a slight headwind. I had a very good start and at 40 meters was level with my competitors. By the half way mark some of the other athletes had started to drop from my line of vision. I kept pushing hard all the way to the finish line………. I had made it… winning my heat as the fastest qualifier with a then personal best time of 52.311. This meant I was straight through to the final the following day without having to compete in the semi-final. Trying to sleep the night before the final was impossible! But I knew that having one night’s bad sleep would not affect my performance. The morning of the most important race and sporting event of my career had arrived. It was an early start at 4:30am to get breakfast and transport to Lagoa ready for the final at 9:08am. There were over eight thousand spectators in the crowd and over 5 million viewers watching live on TV. I had some last encouragement and supportive words of advice from my coach and that was it – off to the start of the race! Some athletes had problems getting into position due to a strong left crosswind. I held my place - then the starter announced ready, set STOP! The start was aborted - someone had come out of the start bucket too early. We began again and then we were off - the cheers from the crowd were amazing. My starting pace was slower due to the crosswind and I couldn’t get a good connection with my paddle until the half way mark. I didn’t panic and continued with my planned race process pushing hard over the last 100m catching and passing the other athletes as I approached the finish with the noise from the crowd getting louder. I passed the finish line – but there was not the usual ‘beep’ to indicate that I had crossed the line. The crowd went quite – you could hear a pin drop – what had happened? I could not see any scoreboard for the results. Suddenly the crowd came alive with cheers – I paddled to boat control and was greeted by the media asking for quotes and photos – it was only then I realised that I had just won a Paralympic Bronze medal - I was convinced I had come fourth. It was only after the medal ceremony that I realised how close I was to winning Gold – it had been a thrilling photo finish with just 300th of a second between 1st, 2nd and 3rd places. 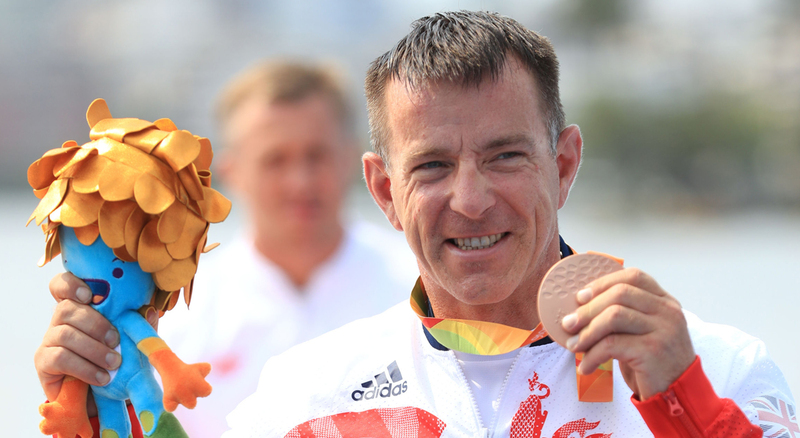 I was not at all disappointed – just happy to be attending my first Paralympic Games and winning a medal of any colour was the greatest feeling.